Some things you just can’t let go.. So, my youngest is almost two. I look around my house and realize that we have a lot of things that he no longer needs. My task is now deciding what, if anything, is worth keeping. You see, I am what I like to call “reproductively challenged.” It’s a game that my body seems to think is entertaining. We were blessed with two “Surprise! You hit the jackpot!” babies and one very expensive “Congratulations! Your investment paid off!” baby. So to say that we don’t know if our family will be expanding is really an honest answer. This does not make going through baby things very easy for me. As I glance around, there are many things that I think would better serve someone else rather than collect dust in storage. Things that I wouldn’t mind simply replacing should we hit that jackpot once again. And then there is that one thing. Every time I glance at it, tucked away in our closet, I am brought back to that time of having a tiny little baby and my heart wants to burst out of my chest. The thought of ever getting rid of it? I just can’t even imagine it. What is that thing, you ask? My Moses Basket. Yes, I bought a Moses Basket. People thought I was crazy. “What are you going to use that for?? 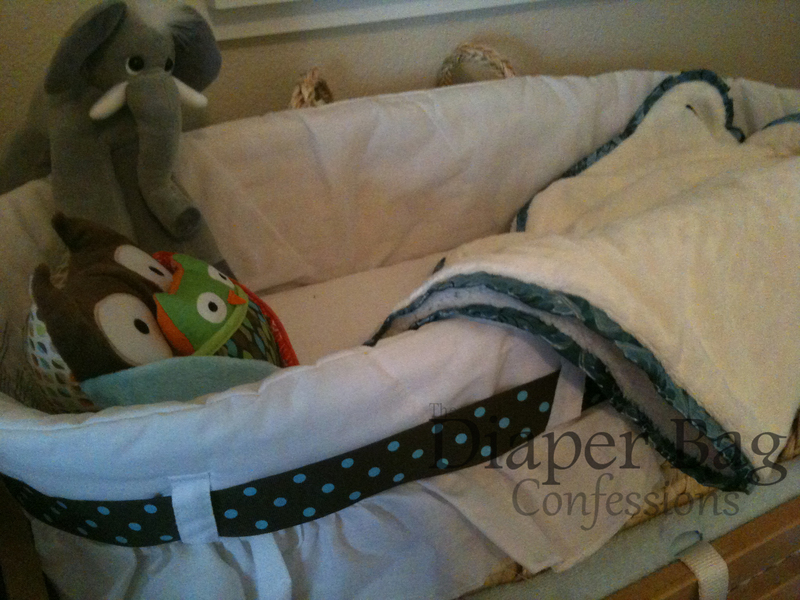 Why not just buy a bassinet?” Honestly.. we’ve done the bassinet thing before. It was alright. We also did the bassinet attachment to a play yard. It worked. But this tiny little basket.. it snuggled my baby so perfectly. It was light weight and portable. I could bring it downstairs for his nap, bring it upstairs for bed, throw it in the car and bring it wherever we were headed. It was the perfect first bed for my tiny little baby, and I just cannot bring myself to let it go. This is not really a waste, though. Should our family not expand any further, there are many ways to re-purpose that little basket. I could fill it with all of my son’s stuffed animals. Use it as a toy bin. Save it for him to use one day for his own child. (Come on.. Moses Baskets are timeless!) For now that Moses Basket has a cozy place in our closet.. and it’s not going anywhere! What things do you have for your baby that you can’t imagine ever getting rid of? Do you invest in things that you know you’ll want to hang on to forever, or things that you are just fine getting out of your house once your baby doesn’t need them anymore? 8 Responses to "Some things you just can’t let go.."
My parents did that too! I guess my dad built it (from a kit I’m sure) and stained the wood himself so he was very proud to have B use it all these years later. We’ve kept everything so far to use again for the next and it’s all been packet away… But I can’t pack up the pajamas that we brought Brenden home from the hospital in. I’ve tried, and I can’t do it. They are still hanging in his closet! Sarah, put them on a shadow box with a hospital pic! In our house, each child has a box of things that are just theirs. Their memory boxes. Things like their coming home outfit, first Christmas, anything special.. it goes in that box and is saved for them forever. 🙂 You should do that with his outfit! Then you can keep it just for him and not be sad about packing it away. Or, as stated below.. a shadow box! So sweet!! I love timeless pieces of baby gear! I wish I bought a Moses basket. It is so cute and practical. I cannot get rid of any of my kids puzzles. I also can’t get rid of their quilts people made. Hand made gifts are things I can’t get rid of, also!! Especially when it’s made with a specific child in mind. Puzzles and books are in abundance in our home, too.. as I don’t want to get rid of them. 🙂 Glad to know I’m not the only person who hangs on to things!